Tired of constantly updating your business's social media accounts? Get our Social Media Manager which does much of the work for you. Filled with pre-made posts & templates, you can easily create ads and post to your Facebook and Twitter (Instagram coming soon). Choose when and how often you want your posts to appear. Have your ads display weekly or daily, it's up to you! Set when you want content to start posting and when you want it to stop... no reminders required! Have different social accounts for different businesses? No worries, you can automatically post to separate accounts and manage all platforms from one portal. This is ideal for multi-chain locations or ad agencies who manage multiple clients. With our easy to use Template Builder you can easily create vibrant posts with your business's look and feel. Easily import & save your logo, add product information with a SKU, or enter any message you'd like to post! With hundreds of templates to choose from, you're sure to find a template for you! All accounts come standard with Admin privileges, meaning you can create user accounts that can manage different accounts or perform different functions. This is ideal for giving clients & employees restricted access. Engage directly with your customers by viewing likes and replying to comments from within the Social Media Manager. that can all easily integrate together. Check out our other features below. What is Social Media Manager? Social Media Manager allows you to easily link your social media accounts and have content constantly posting to your pages. You can also automate the process by scheduling ads in the future or creating a running loop of posts which are automatically posted to your social media accounts. What types of platforms do you currently support? We currently support Facebook & Twitter (Instagram, Yelp, and other platforms coming soon). You can also link Facebook and Twitter business pages. How many postings can I schedule and what is the process like? You can create an unlimited number of posts and schedule up to 1 year in advance. With our easy to use system, you can specify how often you'd like a post to appear (e.g., once per day, twice a week). Each time you create content it is added to your "Loop" and the content will automatically be posted. What type of templates do you provide? We have hundreds of templates to choose from with different themes such as holidays or special events (e.g., Lady's Night or BBQ Sundays). You can choose a template and easily add your information or product details. You can also create your own templates that you can use over and over again. 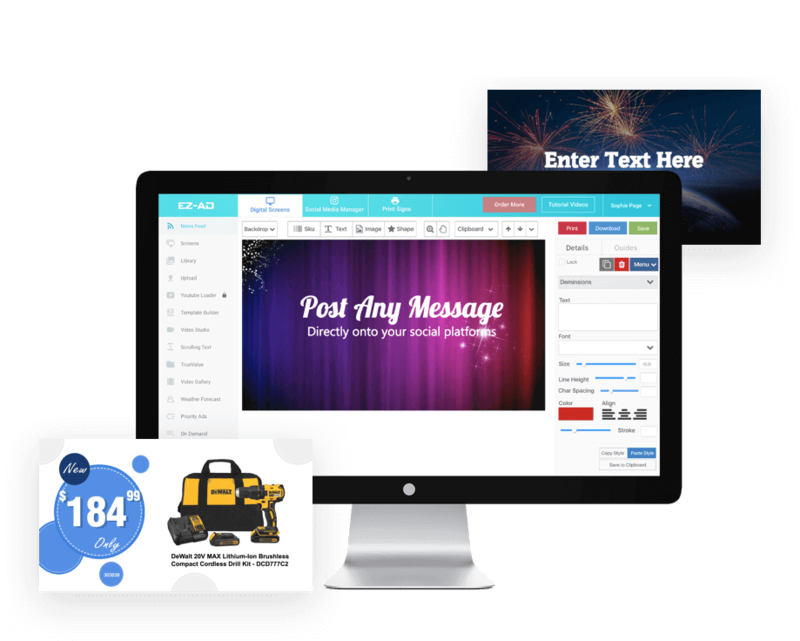 EZ-AD's Template Builder is a powerful yet simple editor that allows you to create posts in minutes. EZ-AD's Social Media Manager allows complete and automatic management of any Facebook or Twitter account. Automatically schedule loops of ads on your Facebook account, and have EZ-AD do the rest. You can easily create posts for Facebook & Twitter using content provided on the EZ-AD portal. Instagram coming soon!